Other than being my uncle’s birthday, St Patrick’s Day has always been a holiday I never gave too much thought to. In the past, it’s just been an excuse to wear green and eat pub food. But that’s all changed now with kids around. St Patrick’s Day is a holiday that’s fun to celebrate. There’s rainbows, leprechauns, and lots of green. Since the beginning of the month my head has been filled with ideas for St Patricks Day crafts for kids and festive recipes. For the last few months I’ve been working with Cakes on doing a special craft for each of the holidays. I bought a 9 pack of canvases on sale and since I’m low on St Patrick’s Day decorations, decided this would be a good craft for the month. While this is a quick craft, I think it turned out so adorable and was still a lot of fun. A little hard to see but this canvas has been painted with a shimmery white acrylic paint to start. To start, I used a foam brush and painted my canvas using a sparkly white paint. Your canvas is already ready to go, but it does add a little extra interest and dimension to your wall art with the subtle shimmer. Bell pepper bottom cut off revealing shamrock shape. 2. 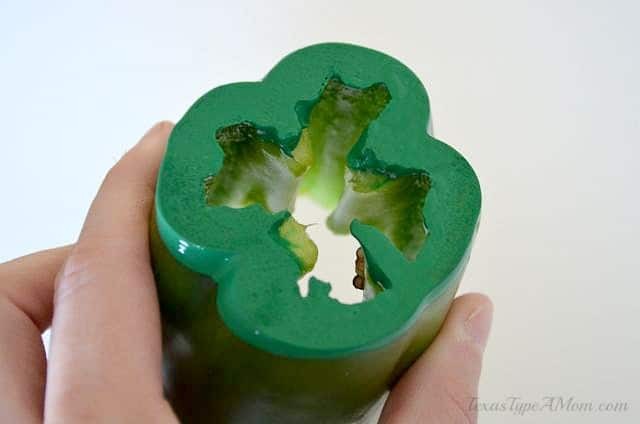 Slice the bottom off of a bell pepper and you’ll have your shamrock shaped “stamp” all set to paint. 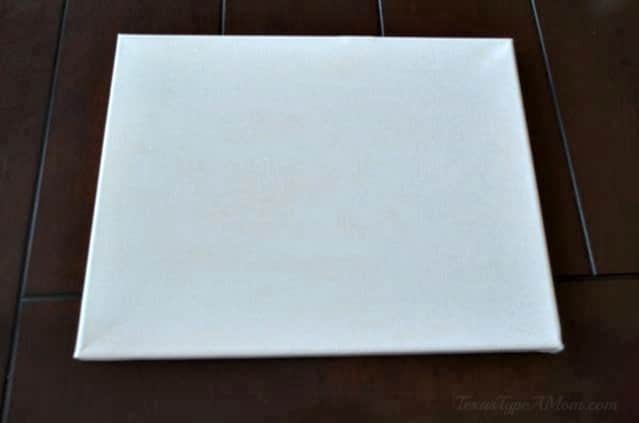 Using a paper plate to hold the paint makes for an easy “stamp pad” and clean up is a breeze. 3. 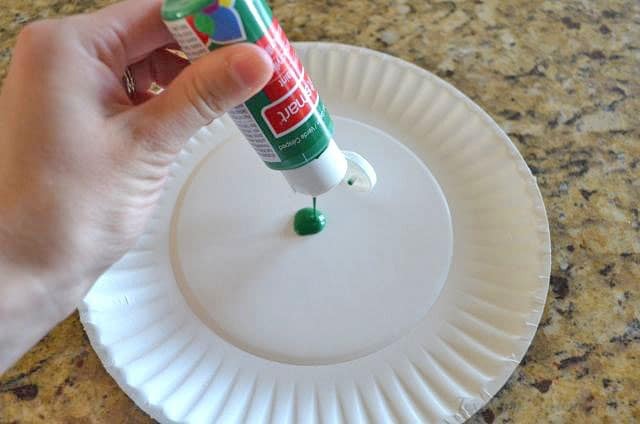 Squirt green acrylic paint onto a paper plate or piece of paper. You want to have the entire surface covered with paint but applying too much will cause the paint to splatter. 4. 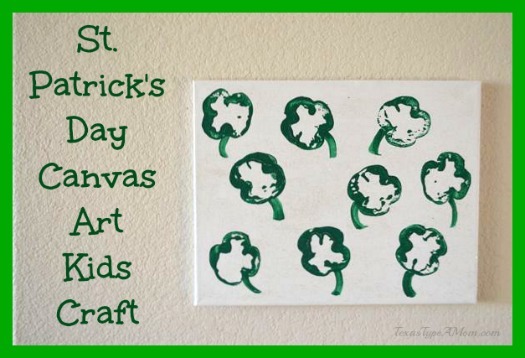 Dip the “shamrock stamp” into the paint and apply to canvas. 5. You can leave it as is, or using a paintbrush lightly create stems for your shamrocks. 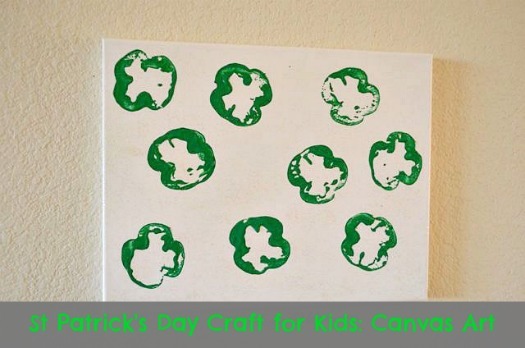 Do you have a favorite St Patrick’s Day craft for kids? This is on my to-do list with the kids. I’ve seen it around everywhere. Fun! I bet my boys would enjoy this. My brother’s birthday is St Patrick’s Day, and his name is James Patrick! haha! We love St Patrick’s Day around here, we’re Irish (but not Catholic) so we like to eat Irish foods and the hubs loves to drink Guinness. OMG how cute! I never, ever would have thought to do something like this, but now I totally want to give it a try! This is such a sweet idea!! I bet this works for all vegis and fruits too! Cute idea! I might have to play! I love this craft! 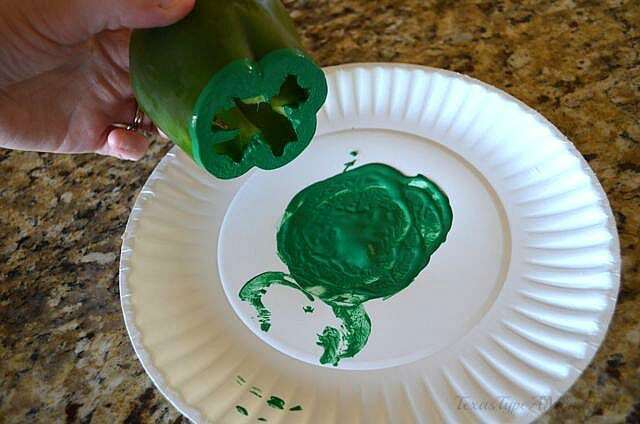 So creative to use a bell pepper. Will have to pick some up at the store. I LOVE this! It would be fun with a rainbow in the background, too!! this is a fun project i’d love to do with my boys!! Cute…and I bet y’all had fun! Thats a very cute idea! I never thought of a bell pepper for that. GREAT idea! Brilliant. I would have never thought of this. I’ve used celery for roses, but never peppers for shamrocks. That’s cool!